Skarynth | They Might Be Gazebos! Yep, I’ve ranted a lot about this game. Time for another one. Something that hasn’t been ranted about too much but does need to get a little shout out. And that’s Vocations. Tracing the origin of this mechanic is pretty easy. And I’m pretty sure I’m on track here. The idea comes from FATE. One of its better ideas. Basically, there’s a thing called High Concept. You use it describe your character overall. And it works for SS&SS and can work for other games as well especially some OSR games. In the case of SS&SS, it replaces the need for a long list of skills. But is should be for much more than that. And that’s how I’m going to use it in my game. Going back to FATE (and that time I ran the Dresden Files RPG), I learned a lot about dealing with this. So here’s what I’ve learned and how I’m going to apply it. First, the Expanded Vocation should describe the character overall. This can include culture, “job”, personality, appearance, quirks and so on. Keeping with mechanics of SS&SS, the Expanded Vocation will not help the character in combat, to cast spells or do something that it the “thing” for another class. It sounds like there isn’t much left but there is. You’ve got the whole range of non-combat and professional skills, social interactions, reputation and so on. And here’s a hint for players and GM’s, take the Vocation both literally and figuratively. Not only should the Vocation give the character a Positive Die when doing things, it should give a Negative Die for doing some things as well. I’m pull this basically straight from FATE. When the player (with the GM’s or other player’s assistance) designs a character’s Expanded Vocation, they should be able to think of three different ways they could use it to their advantage and three different ways it could be used to the character’s disadvantage. Now, I admit that this may take more time than it takes for the rest of character creation. That’s OK. One of our standard house rules is the Three Session Rule. Basically, you can change up your character if you don’t like but you can do that only for the first three sessions of a campaign. Like I said, the player doesn’t have to do it alone. The GM and the player’s should give some advice. Just don’t tell the player what they have to do. You know what I mean. Moving right along on to bigger things. My campaign//play test begins on Thursday. Yep, you heard that right play test. I figure it’s time to let this cat out of the bag. I had a brief email exchange with Diogo and he gave a thumbs up. So after a couple years (my god has it been that long), I’m going to get something up on RPGNow. Don’t worry folks. Keeping with the tradition of SS&SS the pdf will be PWYW. The World of Skarynth is making a come back. I’ve played with this setting for a long time and SS&SS fits it and works (hopefully). I have faith that it’s going to work. Let me put it that way. Right now, we’re going to be play testing the new classes, races, spells, and monsters plus giving the setting a chance for contact with some players. So it’s play test, edit, lay out and publish. That’s the plan any way. So now that I’ve said it, I’m crossing my fingers. And don’t worry. More details will follow as things get finalized. Swords & Wizardry Appreciation Day: Shamelss Self Promotion! It’s evening time so I figured things are calming down a bit. Time to do some shameless self promotion. Like you’ve probably already figured out, I like Swords & Wizardry. So much so that I’m will to throw a whole bunch of time and some money into publishing some stuff for it. Most of my thoughts are over on Magic Pig Media but I’ve to post more news and updates here about what I have planned. Swords of a Forgotten Age: The World of Skarynth: This is going to be the first product out the door. Right now, we’re in the final stages of editing and play testing then it’s time for layout. Keep for fingers crossed. 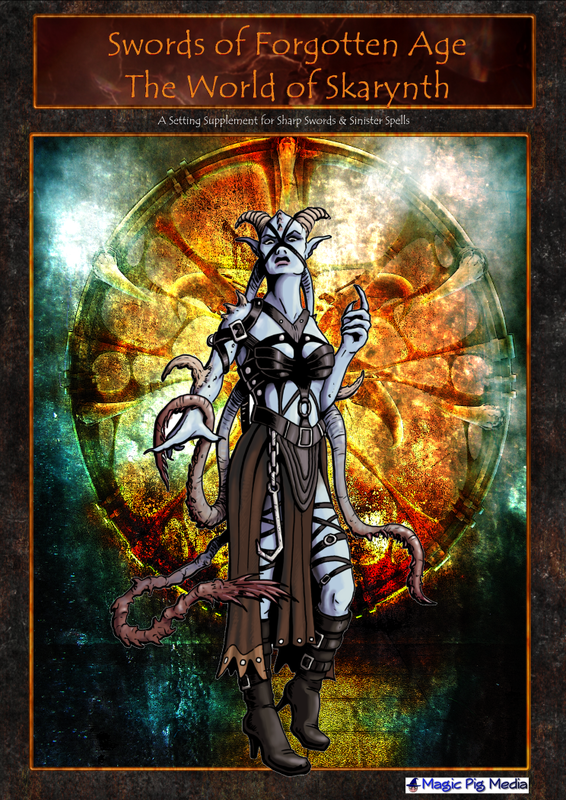 This is a Swords & Sorcery setting/source book and heavily influenced by Crypts & Things. We’ve come up with some new mechanics as well as some twists of classic classes. We’ve already got two more supplements planned for this so stay tuned for announcements on those in the future. Adventures: Also, We’ve got two adventures in the works for Swords & Wizardry. Those are in the rough draft stage. As they get closer to completion expect more announcements on those in the coming months. A SciFi Hack: I can’t just get this idea out of my head so it’s obvious that I need to follow my muse. Heck, it doesn’t even have a working title yet. I’ve amassed a couple pages of notes and started outlining it. This isn’t going to be a hard science fiction game but something that just mixes and matches a whole host of things that have been bouncing around inside my head. Like I said for the Adventures, stay tuned for more announcements on that. Super Secret Fantasy Setting X: Heck, you’re not expecting me to come clean on everything. But this is another setting that should have some very familiar tropes to Old School Gamers and still be very interesting. More on that as that rough draft gets done. I know that’s a lot of projects for a little one-man show. It’s enough to keep me busy for well over the next year and yes I’ve scribbled out notes on my calendar. Heck, I’m already trying to find a 2014 calendar to schedule things. I know better than to announce any rough release dates, things have already gone crazy a couple times. Wish me luck and I’ll keep ranting about these as they get closer to completion.